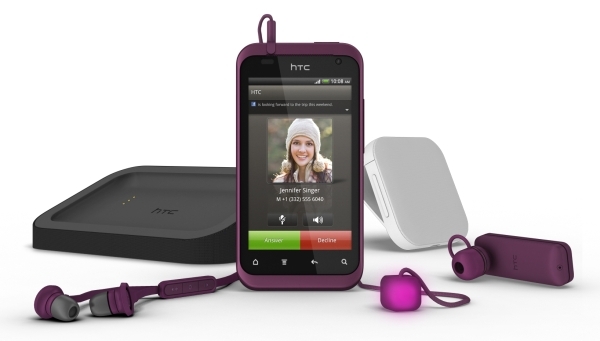 The HTC Rhyme is a device primarily presented with colors like plum, light green and beige. In design Rhyme has a very simple and elegant design. Undoubtedly it is one of the classic designs presented by HTC. The entire design of the phone is divided into two parts. The first part is the metal chassis, which is around the display on the front and as a thick band in the middle on the back. It bisects the two plastic portions that is one of the most important design segments. Each of the plastic segments has a bit different color from the metal around it. The device has a 3.8 inch display. For reaching the SIM card and the microSD card one requires sliding the plastic portion at the bottom of the phone. The most important segment of HTC design is Charm accessory. The Charm is a sugar cube sized object at the end of a cable that plugs into the headphone jack. It has a clip for attaching to bag and glows when you have a missed call or message. This is a nice way to alert women who keep their phones in their bags and pursues. For Display the HTC Rhyme has a 3.7-inch 800 x 480 resolution TFT LCD. The display is made from Corning’s Gorilla Glass to provide additional protection from scratches. The quality of display is quite and the colors appear vibrant and the white balance is spot-on. However viewing angles are not as good and smart as AMOLED or IPS displays. The HTC Rhyme has a 1 GHz Qualcomm Snapdragon MSM8255 processor and 768MB of RAM, enough to operate applications to 3D games. On the software side it has HTC Sense 3.5 on top of Android 2.3.5 Gingerbread. The HTC Rhyme has a 5 megapixel camera with auto-focus, LED flash and 720p video recording. The camera applications are simple and easy to use have all the basic features like auto-focus and touch-to-focus. The videos are bit troublesome and pixellated. Dropping the resolution to 480p improves the picture quality of the video. On the course of music playback the phone equally fares quite well. Its default music player is been provided with multiple audio presets. The video player on the Rhyme is constructed into the Gallery app. It plays AVI files. The HTC Rhyme has a 1,600 mAh internal battery. With Wi-Fi and 2G network the battery survives through one and a half day. The HTC Rhyme priced currently at Rs. 25,950.